Coupon: 10% off any purchase this month with code Oct10. 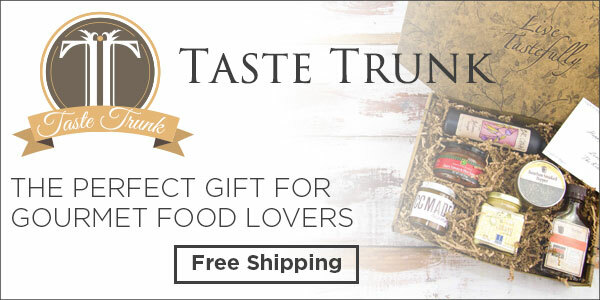 Taste Trunk produces premium gourmet gifts for all occasions. From themed trunks to monthly memberships, we gift package hard-to-find gourmet brands into a beautiful vintage trunks and deliver them direct to the recipient’s mail box. Our trunks are designed for people that love food. Whether in the form of a one-time chocolate or bbq gift or with a monthly subscription, we are a cooks favorite kitchen delivery. What do you think about Taste Trunk? ← Your Bijoux Box: Spicy Fall – The October Collection! Sneak Peek #2!